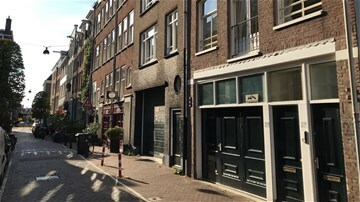 Noorderstraat 27 A AMSTERDAM, Centrum - Peter Bruin Makelaardij o.g. b.v. 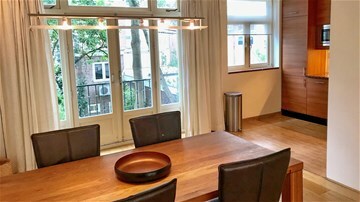 Fully furnished two bedroom duplex 105m2 apartment with 50m2 garden and conservatory for rent, conveniently located in Amsterdam's city center Canal Belt district. 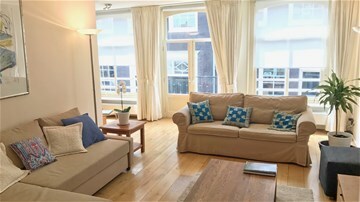 This beautiful and spacious apartment of approx.105m2 is located in the Amsterdam's city center Canal Belt district. 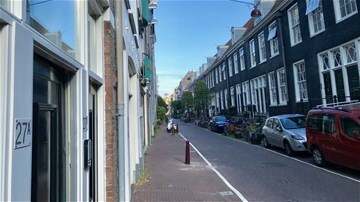 It is on a quiet side street of the Vijzelstraat and just behind the Prinsengracht canal. This stylish duplex (ground and first floor) apartment with a grand conservatory and large sunny garden has just been renovated with a brand new quality kitchen and bathroom. The interior has been designed with comfort and quality in mind. 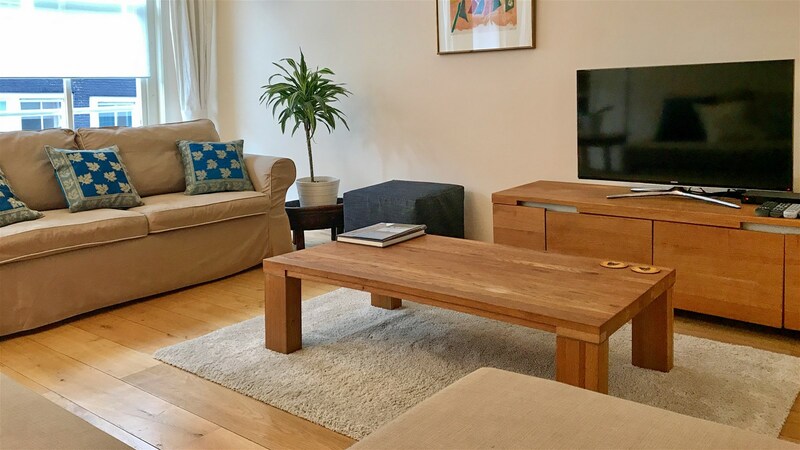 The designer furnishing, oak wooden flooring and spatial layout bring about an overal calm and relaxed feel which is perfect for coming home after a long day of work. 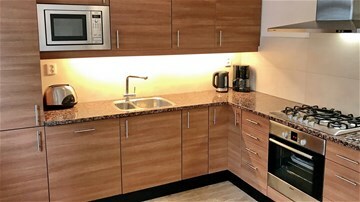 This rental apartment comes fully furnished with beds and furniture, washer and dryer (Siemens) and well-equipped kitchen including all necessary appliances (Bosch), utensils, crockery and cutlery, quality bedding and soft premium towels. 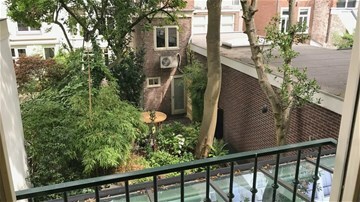 The property is located in the heart of Amsterdam within the Canal belt, a historical neighbourhood with its typical canal houses. This area is known for its quiet side streets, cute little cafés and artisan shops, and friendly local atmosphere. It is situated centrally between the major entertainment areas which include public squares like Leidseplein, Marie Heinekenplein, Rembrandtplein and is considered one of the best areas in the city offering great shopping, local markets, classical theatres, modern cinemas, top fitness gyms, art galleries, famous museums, and a range of bars and restaurants. 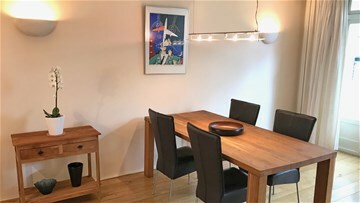 From this quiet apartment you are within walking distance to the famous museums including Van Gogh, the Stedelijk and the Rijksmuseum, as well as the Albert Cuyp market, the Concert building, and the Vondelpark. 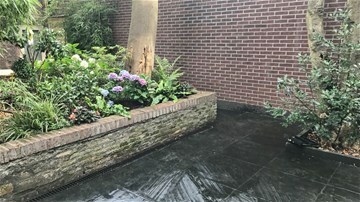 The location has great public transport connections to World Trade Center district and Central Station (trams 16, 24), the RAI Convention Center (tram 4) and Zuid-Oost Business District and Ajax Stadium (metro 50 and 51). It is easily accessible by car and has good connections to other parts of the city through the highway Ring A10. You have an easy commute to Schiphol Airport by public transport (30 minutes) or taxi (20 minutes). For all the short distances, walking and biking will be your main mode of transport, just like the locals do. 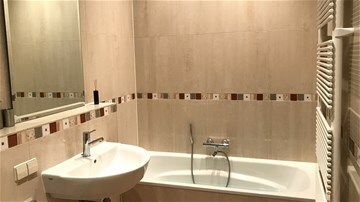 The private entrance is located on the ground floor and takes you into the main hallway. Here you have a hidden washer and dryer, and a special guest toilet. 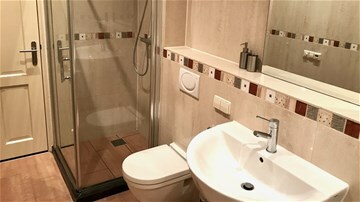 At the end there is a spacious bathroom with a modern design that includes a bathtub, wash basin, separate walk-in shower, modern toilet, towel radiator and tiled floor with heating. 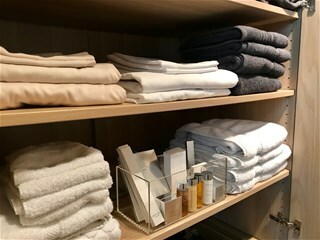 As you continue you enter your walk-in closet room with adjacent to it the master bedroom which includes a king size bed and oak wood flooring. 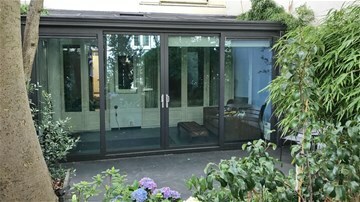 Further down you enter the spacious glass conservatory room which doubles up as a second bedroom for guests and can also be used for yoga, fitness or as a home office space. 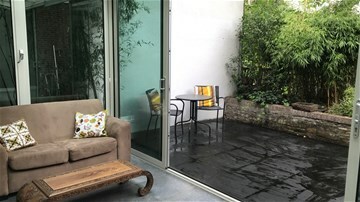 From here you gain access to the sunny garden and patio (50m2) where you can have your morning coffee or invite friends for a garden barbecue. Back inside the "lazy" carpeted staircase in the hallway brings you to the first floor. 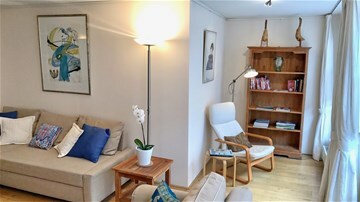 Here on the front side of the apartment you find a large comfy living room with two big pull-out sofas, a new 32" flatscreen smart TV for Netflix, Spotify and international news and sports channels, and a special little study corner that catches the sun during the day. On the backside you have your dining area and brand new open kitchen which is equipped with all the necessary built-in appliances (microwave, oven, toaster, coffee maker, fridge, freezer) and a five pit stove for cooking. 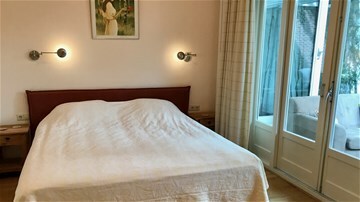 The apartment has a special thermostat climate control system that regulates the temperature through the apartment and a newly installed ventilation system to control the fresh air flow in all the rooms. The windows on both floors, front and back, have double glass, and include French style balconies on the first floor that completely open up. All windows are lined with curtains and roll up sunshades for privacy and those sunny days. Important info about the internet. The high speed cable wifi internet of 50mb/s is strong and reaches all corners of both the ground and first floor. It can be bumped up to 100mb/s by upgrading the contract if required. The cable TV channels come with a range of HD sports and movie programs on demand. 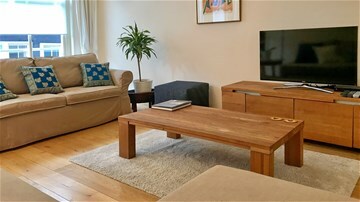 The rental price of this apartment is exclusive an advanced payment of approx. 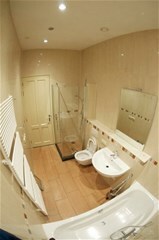 EUR 250,-- a month extra for the use of exclusive Gas/Electricity/Water, TV/Internet and local Taxes.